Blog 8: Back to school - what shoes to buy? As we prepare ourselves for the school year ahead, typically one of the activities on the list is to buy new shoes for our ever-growing children. As our kids get older and morph into “independent” teenagers, we not only need to make sure we are buying the right shoes for their feet, but we also need to consider the right shoes for their image in the schoolyard – something they will have a lot to say about. It’s a great outcome when we can buy shoes that support our children’s growing feet, while also buying them shoes that are happy to wear in front of their friends. Buy the right size: When buying shoes it is tempting to buy a size too big for them so they can grow into them (and you’re not back at the shoe store in a couple weeks). We don’t recommend this as buying shoes that are too big can lead to a range of issues such as clawing of toes, knee pain and blisters due to excessive movement of the foot inside the shoe. Buy shoes that provide good support: This is where you and your child may differ in opinion, but it is very important that any shoes you consider buying have a sturdy sole and stiff heel. Make sure you try and bend any shoes they want you to buy them to make sure there is adequate strength and support in the arch. If the shoe bends like a thong, that’s a definite no – regardless of how “cool” your child thinks they are. You should always insist that your child wears shoes with laces or buckle, and that the shoes are deep enough for their feet and not too tight. We also recommend you remove the inner sole from the shoe and place it on the ground, then get your child to place their foot on it – if their toes go over the end, the shoe is too small. If buying shoes for sport, do your research: If you are buying shoes for your child’s sport, make sure you do your research on the particular type of sport they are playing and buy shoes to match. Your child could damage their feet if you buy them running shoes that they wear playing tennis. Running shoes are not designed to twist and turn around a tennis court, so be sure to talk to your child about the importance of matching the right shoe to the right sport. They may absolutely love the latest Nike basketball shoes but they won’t be able to run around the track in them due to the high ankle support. One for the teenage daughters – avoid high heels: This is one for the older teenagers that may be starting part time jobs during their final years at school that allows them to dress casually. Teenagers’ feet are still developing as they approach their 20s, so regularly wearing high heels can do significant damage to your daughters developing feet. Squashing the toes into a narrow toe box, while focusing the body weight on the ball of the foot can lead to flattened arches, bunions and a range of other foot aliments you want your daughter to avoid. Encourage your teenager to look after their shoes: Once you have made a purchase you can both agree on, it is important to encourage your child to look after their shoes and practice good foot hygiene (e.g. don’t leave sweaty socks inside their school shoes as it will increase the chances of tinea). We also recommend, particularly with sports shoes, that children make sure they clean them after use if required. Leaving mud caked on footy boots will significantly shorten their life and make them less flexible and supportive for your children’s developing feet. 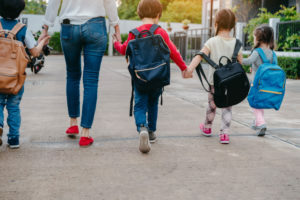 So, with a little expectation setting up front (and a good helping of patience), you should be able to agree on a pair of school shoes with your children that provide good support for their feet, and they will wear proudly in front of their peers. All the best!